When I was a nutritionist at WIC, I was a preceptor to nutrition interns from the nearby university. It was fun to meet these grad students who were about to embark on their nutrition careers. Some of them came and went, and some became friends. Notably, one became my best friend (Hi Linds!). One intern was from Korea, and she popped into my office and introduced herself as “Chi-Yun!” in such a happy voice. She was super sweet, and gave me this recipe for bulgoki. For that, I love her. Justin made this while I was at work one day, so I can’t vouch for how easy it was to do. I think he mixed up a few steps, too, but it still turned out to be fantastic. If you’re craving bulgoki and don’t have a Korean restaurant nearby, try this out. Here’s the recipe, in her words. 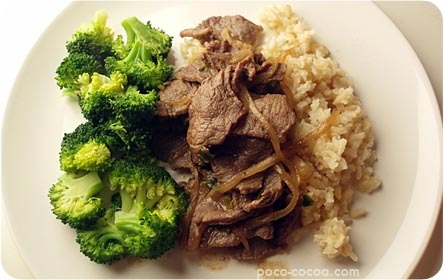 (Optional) Mix sliced beef with grated kiwi or cola for 1 – 2 hours. This will make beef tender. If you use kiwi, you don’t have to remove it after. If you use cola, drain cola from the beef. Combine the sauce with the meat, onion, and green onion and mix well. Let stand 1 – 2 hours in the refrigerator. Barbecue or pan fry (with a little oil or none). I’m so glad we stuck – not sure where I’d be without my Crys! I love you!